A groundbreaking Retina display. All-flash architecture. The latest Intel processors. 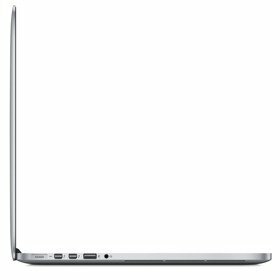 Remarkably thin and light 13-inch and 15-inch designs. Together, these features take the notebook to a place it's never been. And they'll do the same for everything you create with it. The 15-inch MacBook Pro with Retina display has the power to do even more amazing things. Fourth-generation quad-core Intel Core i7 processors provide the fastest performance ever in a MacBook Pro. 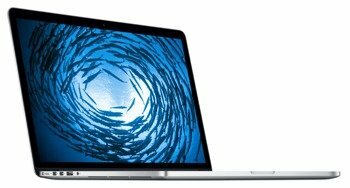 With fourth-generation Intel Core processors, the latest graphics, and faster flash storage, the incredibly advanced 15.4-inch MacBook Pro with Retina display moves even further ahead in performance and battery life. 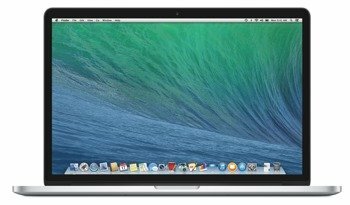 This version of the 15.4-inch MacBook Pro with Retina display (model ME294LL/A) features a 2.3 GHz Core i7 quad-core processor, 256 GB of flash storage, and 16 GB of onboard RAM. It also offers a combination of Intel Iris Pro integrated graphics and the NVIDIA GeForce GT 750M discrete graphics processor with 2 GB of video memory. It's powered by OS X Mavericks, the world's most advanced operating system and built to bring out the best in your Mac. And the MacBook Pro comes pre-loaded with the latest version of the iLife software suite (iPhoto, iMovie, and GarageBand) as well as the iWork productivity suite (Pages, Numbers, and Keynote). The MacBook Pro also includes both a high-speed Thunderbolt port and two USB 3 ports, enabling you to easily connect to external displays and a wide variety of high performance peripherals. With up to 60 percent faster PCIe-based flash storage compared to the previous generation and new 802.11ac Wi-Fi for up to 3x faster wireless, the new MacBook Pro is quicker and more responsive than ever. You'll also get up to 8 hours of battery life while on the go. At over 5 million pixels (220 pixels-per-inch), the Retina display's pixel density is so high the human eye cannot distinguish individual pixels from a normal viewing distance, so text and graphics look incredibly sharp. Images take on a new level of realism and text is pin sharp. And with a 2880-by-1800 resolution, you can see more of your high-resolution images onscreen with pixel-for-pixel accuracy. You'll see fine details and textures in photos like never before, and even tell which photos are in focus just by looking at the thumbnail. The Retina display uses IPS technology for a 178-degree wide viewing angle. Since OS X is designed to take advantage of each core, the fourth-generation Intel Core i5 dual-core processor (based on the latest Haswell architecture) captures every bit of performance from the processor. When you need more power for a processor-intensive application like Aperture or Final Cut Pro, Turbo Boost 2.0 automatically increases the speed of the active cores. And by shifting core frequency in small increments, Turbo Boost allows the processor to manage performance without sacrificing efficiency. This model features a 2.3 GHz quad-core Intel Core i7 processor with Turbo Boost speeds up to 3.5 GHz. It's complemented by Intel Iris Pro integrated graphics with 128 MB of embedded memory, which can accelerate processor- and graphics-intensive tasks by acting as an ultrafast cache. Additionally, this MacBook Pro with Retina display has a second graphics processor — the discrete NVIDIA GeForce GT 750M with 2 GB of GDDR5 memory with twice the video memory of the previous-generation NVIDIA graphics processor. You'll be able to see more frames per second in 3D games and get greater speed and responsiveness for your HD video projects. Just 0.71 inches thin (view larger). With its entirely flash-based architecture, the MacBook Pro with Retina display makes everything you do incredibly fast and responsive — starting up takes seconds, apps launch quickly, even navigating the desktop feels incredibly fluid. The key is the new PCle-based flash storage, which provides faster read and write performance — up to 60 percent faster than the previous-generation MacBook Pro. And flash storage is extremely energy efficient, which means your MacBook Pro also has the ability to stay in standby mode for up to a month, without plugging in. The MacBook Pro now supports ultrafast 802.11ac Wi-Fi. When connected to an 802.11ac base station — including the AirPort Extreme and AirPort Time Capsule — wireless performance is up to three times faster than with the previous generation of MacBook Pro. And your Wi-Fi range improves as well. Delivering an amazing 10 gigabits per second of transfer speeds in both directions, the ultrafast and ultraflexible Thunderbolt port allows you to move data up to 20 times faster than with USB 2.0 and more than 12 times faster than with FireWire 800. You can also daisy-chain up to six Thunderbolt-compatible peripherals without using a hub. Thunderbolt also supports DisplayPort for high resolution displays and works with existing adapters for HDMI, DVI, and VGA displays. The MacBook Pro also comes with two USB 3 ports, enabling you to connect your external hard drive and transfer large files in seconds instead of minutes with speeds up to 10 times faster than USB 2. And you can connect all your USB-compatible devices, including your iPhone, iPad, iPod, or digital camera. At the heart of every MacBook Pro — and every Mac — is OS X Mavericks, the world's most advanced desktop operating system. It features an amazing collection of apps you'll use every day, and it includes advanced technologies that boost performance and battery life. OS X Mavericks works with the MacBook Pro's super-responsive trackpad so Multi-Touch gestures feel natural to use, and technologies like Power Nap take advantage of the Mac hardware to keep the entire system up to date while it sleeps. The iLife suite of creativity apps helps you do more with photos, movies, and music than you ever thought possible. The iWork productivity apps make it easy for you to create, edit and share stunning documents, spreadsheets, and presentations. Because Apple makes the hardware, the operating system, and many applications, the Mac is a truly integrated system. And only the AppleCare Protection Plan gives you one-stop service and support from Apple experts, so most issues can be resolved in a single call. Extend the complimentary service and support on your Mac to 3 years from the original Mac purchase date with the AppleCare Protection Plan. You get direct telephone access to Apple experts for technical questions, and you get global repair coverage--including both parts and labor--for your Mac and select Apple peripherals. Need an extra adapter for home or work? The MagSafe 2 Power Adapter is held in place magnetically, so if someone trips over it, the cord disconnects harmlessly while your MacBook Pro stays put on your desk. The world's first Thunderbolt display doesn't just give you more pixels. It gives you more possibilities. Built-in Thunderbolt technology lets you connect as many as six devices through a single port and transfer data up to 20 times faster than with USB 2.0. Compact and convenient, the Apple USB SuperDrive connects to your MacBook Air with a single USB cable and fits easily into a travel bag. It lets you install software and play and burn both CDs and DVDs, including double-layer DVDs. The easy-to-use AirPort Extreme Base Station with next-generation 802.11ac Wi-Fi is the perfect wireless access point for home, school, or office.1 It offers simultaneous dual-band support and delivers high-performance Wi-Fi for Mac computers, PCs, iPhone, iPad, iPod touch, and Apple TV.